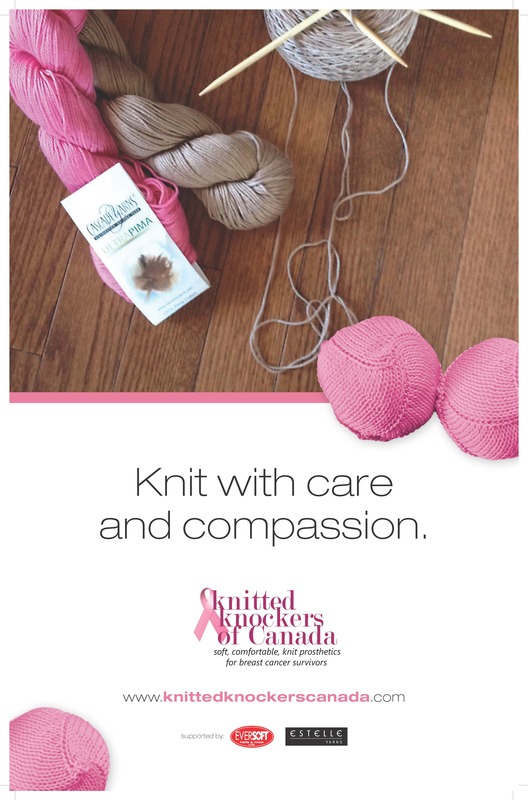 Knitted Knockers of Canada is an organization that we have talked about on the blog before, but it is one that we felt was very much worth a repeat mention. Knitted Knockers provides knitted prosthetic breasts to women who have undergone mastectomies or other procedures to the breast. And what’s more? These soft, comfortable, lightweight prosthesis are available for FREE to anyone who requests one. And this is where you, the knitters come in! Each Knitted Knocker takes only one skein of Cascade Ultra Pima. In fact, it is quite likely that you will get at least two, (maybe even three!) out of each skein. Now that’s a whole lot of good from just one skein of yarn! Ultra Pima is widely available in yarn shops across the country. Just be sure to ask the next time you are in! So today’s free pattern is available by clicking on this link. And you guessed it… It’s a knitted knocker! If you prefer crochet over knitting, but still want to whip up a few, the Knitted Knockers of the USA have a pattern on their website, as well as patterns for knitting using the Magic Loop technique, as well as knitting back and forth on two needles. Alternatively, there are several yarn shops across the country who have agreed to be drop-off points for those who find that option to be more convenient. While neutral colours are preferred, there is no reason why you can’t knit a few in some fun shades! So gather together your knitting friends, fill a big mailing envelope with some knitted knockers and help make a difference! Thank you so much for this post and helping to spread the word…..it is such a great cause and only take a short bit of time to make a knocker! Our pleasure Nancy! And thank YOU for all that you do! We are thrilled to be a part of such a fantastic project. Keep up the good work!